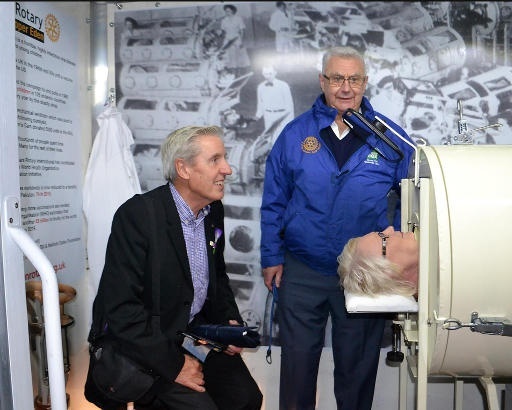 Lytham Rotarian Rob Dunn (seated) chats to RotaryGBI President 2019-20 Donna Wallbank as she experiences a few minutes in a replica iron lung built by Roger Frank, and transported to Lytham by fellow Upper Eden RC member John Begg (standing). The Prosecco corks popped and there was a fizz in the air South Fylde's Gala preview showing of ‘Breathe' — the film that promises to be the cinema hit of the year. 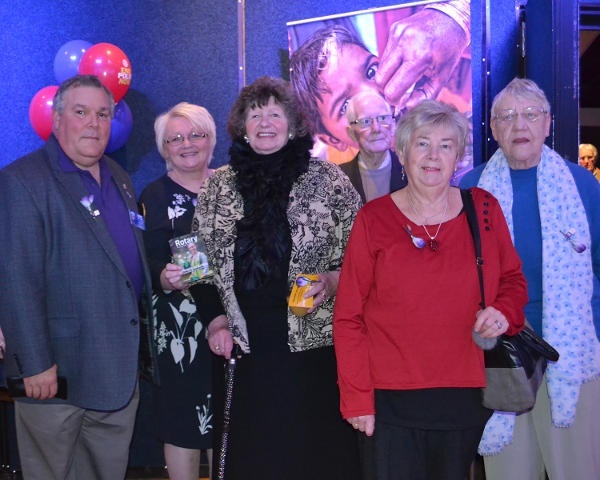 Around 250 Rotarians and other cinema goers filled the reception area of Lytham's Lowther Pavilion before stepping on to the red carpet and enjoying their Prosecco in style. The event was a coup for the District being the first advance showing of ‘Breathe' in England and the first such event for the newly refurbished Pavilion Theatre. A joint venture by the three South Fylde Rotary Clubs of Lytham, Kirkham and Rural Fylde and St Annes, the event was also a commemoration of World Polio Day on 24th October and served to raise £2000 to end polio, which will be turned into £6000 thanks to the Bill and Melinda Gates Foundation. District Governor Larry Branyan welcomed everyone and congratulated the Clubs on working together as a cluster to present such an historic evening. Prior to the film the audience heard on video from Bill Gates and other well-known personalities about the importance of reducing polio figures to zero. Leading actor Andrew Garfield who portrayed Robin Cavendish - the world’s longest living ‘responaut’ spoke on the Andrew Marr Show the following morning praising Rotary for its part in helping slash the number of polio victims from hundreds of thousands a year to single figures. ‘Breathe' went out on general release on 27th October. District Governor Larry Branyan and RotaryGBI President 2019-20 Donna Wallbank with winners of the the local newspaper competition for tickets for the event.